Mia, U.S. 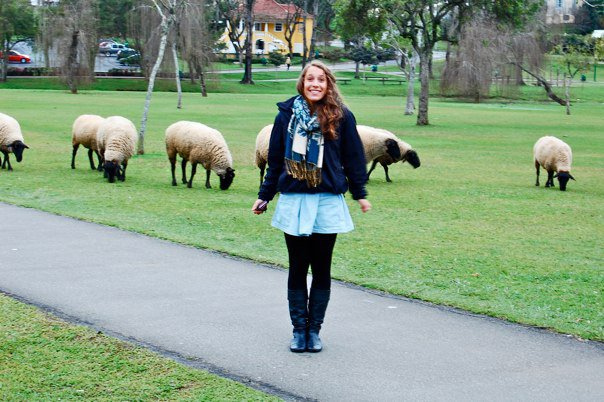 Youth Ambassador discovers sheep at a local public park in Curitiba, Paraná, Brazil in August 2010. When Mia Stroutsos was selected as one of thirteen United States Youth Ambassadors to Brazil, her world began to turn in a different direction. For twenty-one days that summer, Mia would engage in cultural comparison in communities, schools, and social projects promoting understanding between the U.S. and Brazil. "Upon arriving to Brazil my expectations were to meet open hearted people, encounter a unique culture, and see famous landmarks and beaches. While all of these things proved to be true, my exchange experience surpassed what I imagined in the most remarkable ways." Mia traveled all over Brazil-- touring Brasilia, Curitiba, her homestay in Guarapuava, and Rio de Janeiro. "I feel so lucky to have seen a different side of Brazil in Guarapuava [located in the southern state of Paraná]-- a place full of rural landscapes, cold winter weather, and interesting diversity. Every day was a new adventure filled with inspiring moments and incredible people. I began my days eating breakfast and chatting with the people who I now call my second family. After meeting at CCBEU [an English center], our group of Youth Ambassadors attempted to put Portuguese words on our tongues, with occasional success. We would then pile into a small bus that drove us across bucolic hillsides and beyond," explained Mia. The group's destinations included a variety of schools and social projects, sustainable farms, a German colony, an indigenous community, and beautiful natural landscapes. Mia sums up her experience by saying, "I still think about the program at some point every day. Before my exchange, during my exchange, and even now, I never expected my life to change so dramatically. I never imagined that I would be able to connect so quickly and so powerfully with my fellow YA's, my host family, and everyone I met along my journey. "My life gained focus, indescribable passion, incredible friendships, and a confidence that I can create positive change in the world. This experience allowed me to grow as a person and leader, and I feel part of a global community. More than anything, I didn't realize how much this program, the country, and the people of Brazil would start to shift my internal wheels and point my life in the direction I'm going in now." For Mia, the impact of this program didn't stop upon returning home. She was granted the opportunity to work on developing an International Youth Ambassadors Network as well as attend two Summits-- a YA Summit in Panama, and a Global Summit for Youth Volunteering in Colombia. "To anyone who wishes to participate in a program similar to this; aim to see opportunities even when you think they are non-existent, aim to find common ground even when you think you're helplessly floating in the sky, aim to cross bridges even when you think they haven't been built, and above all else, learn from the stories that are being woven around you. I will never forget how Brazil: the country, culture, and people, jumped out at me, pulling me in as if never to let me go."